Who's excited for months old TMZ videos and hot takes? By now you’ve probably heard that Fox Sports and Jamie Horowitz have imploded the Fox Sports website and turned it into a video-only enterprise that has completely abandoned any semblance of written content. Hopefully you’ve also taken the time to read our lengthy dive into the tumultuous last year at Fox Sports Digital that led up to the shocking transformation of Fox’s website and many layoffs at the company. That piece includes stunning details like Fox Sports writers being asked to ghostwrite content for Skip Bayless and Colin Cowherd before ultimately being let go and stories of how Horowitz demolished almost every single successful thing Fox’s digital enterprise was accomplishing from the inside out. It is a harrowing time for the sports media industry. If one of the largest sports networks and most significant sports websites in existence can say that they have no need for sportswriters of any kind, it’s not exactly an encouraging time to be a sportswriter. And coming on the heels of highly publicized layoffs at ESPN and elsewhere, it’s distressing for anyone and everyone involved in sports media. But just looking at the new FoxSports.com in a vacuum, what does the new website provide fans? Is there actually any merit in moving to a video only platform or is it as crazy as it first seems? Now that the rubble has settled, it’s worth analyzing what the new Fox Sports website offers fans so you know whether it’s something to add or remove from your bookmarks. 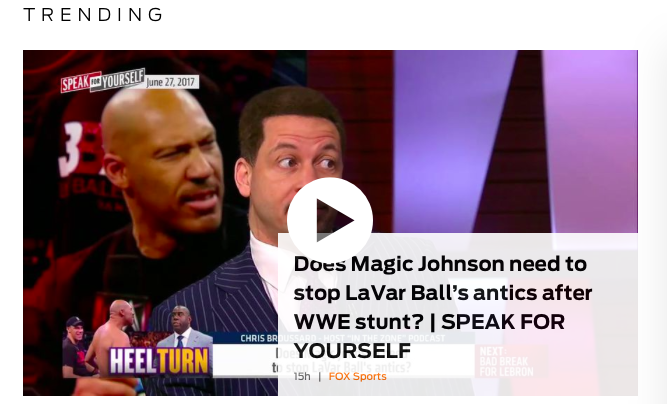 On Wednesday morning, the top two videos featured on the Fox Sports homepage were both of Chris Broussard on Speak for Yourself. The first was about LaVar Ball appearing on Monday Night Raw, which by now has happened two days ago. The second was debating whether Carmelo Anthony or Dwyane Wade would be a better fit for the Cleveland Cavaliers. By contrast, ESPN, Sports Illustrated, and CBSSports.com all led with the breaking news of Phil Jackson’s parting of the ways with the New York Knicks. That story was nowhere to be found at Fox by 10 AM ET. In total there were 28 videos featured on the Fox Sports front page. Here’s how those video selections broke down. That TMZ selection is worth lifting up in further detail. 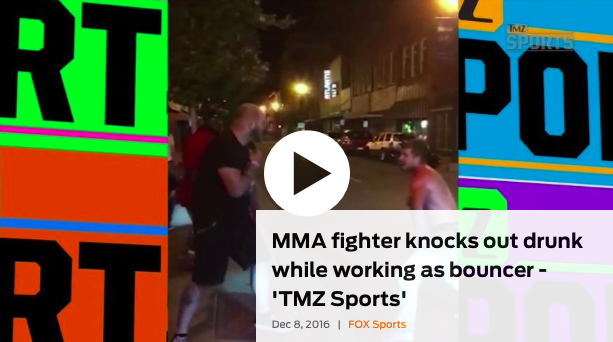 It’s dated December 8th, 2016 and features an MMA fighter knocking out a random drunk guy as a bouncer. Seriously. It’s like someone put the random ad at the very, very, very bottom of any article you read (you know, the ones that say “7 Celebrities Whose Secrets You Will Not Believe”) and turned it into an entire website strategy. You can say Fox Sports Digital has come full circle. Two years ago, Fox cut loose writers from their regional sports websites, laying off individuals who covered teams at a local level to focus on short-term video. One of those regional Fox Sports writers told Awful Announcing in 2015, “Fox has made a large swing toward video and buzz content in the past year or two.” No kidding. But here’s the irony. Two years after Fox gutted their regional websites to move towards more video, now the national website is using a heavy reliance on that content from the regional networks to fill FoxSports.com. Pretty much every video on Fox’s MLB page is a highlight from their regional networks. It fits with the new Fox Sports ethos because it’s Fox branded content, but if you’re an MLB fan, it only represents a certain subset of everything MLB. Fox doesn’t have regional contracts with every MLB team, so you’re only going to get the teams that are covered by Fox at the local level. 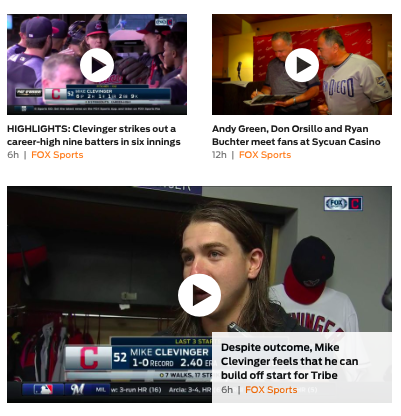 If you’re a Cleveland Indians fan, why not just skip the middle man and go directly to the Fox Sports Ohio website where you can watch the same videos and also get AP recaps of the games? If you’re a fan of Major League Baseball as a whole, there isn’t much incentive to visit Fox either. Go to Fox Sports and get highlights from only certain teams. Go to MLB.com and get highlights and news and features and everything else for every team. The choice is pretty clear, right? Here’s the central issue with Fox’s new strategy – there’s zero depth of content on the new Fox Sports website. Any click off the homepage represents an embarrassingly short supply of relevant material. You’ll see outdated videos and a complete lack of contemporary news. Even the clips of FS1 debate shows, which I guess is what this is all about promoting, seem like more of a hodgepodge of “Embrace Debate’s Greatest Hits” versus something that’s actually timely and interesting. There are ten videos on the front of the Fox Sports NFL page, eight of which are from last week. Last week! Two of those videos are duplicates! 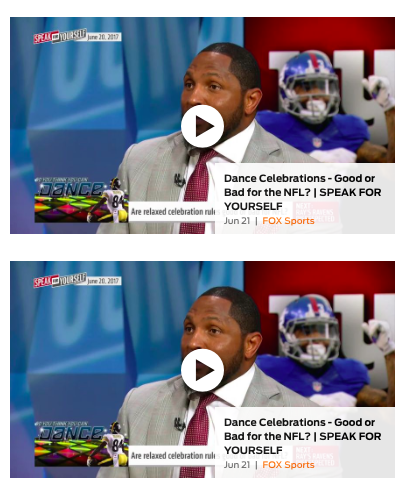 Fox must really want you to hear Ray Lewis’ week old take on NFL celebrations. Not only is this bad content, it’s bad curation. Who is wanting to take the time to watch a week old video about a week old story and why is it on the page twice? The soccer page is nothing more than MLS or Confederations Cup highlights. The most recent video on the NCAA Football page is from TWENTY DAYS AGO. Granted it’s the offseason, but still… for a company that featured top writers like Bruce Feldman and Stewart Mandel and has plenty of college rights, this is truly baffling. The most recent NCAA Basketball video is from May 13th! 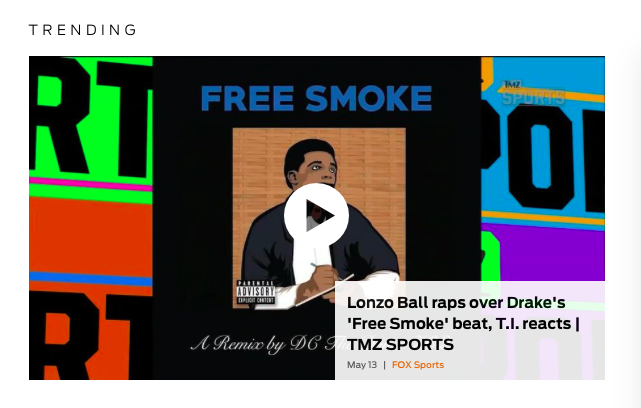 And it’s TMZ talking about a Lonzo Ball rap. Is this really still “trending?” Lonzo Ball just got drafted! Spend any length of time on the new Fox Sports website and you’ll learn pretty quickly that there is just nothing there. The lack of relevant content is astounding. And that’s painful to say, considering all the good things Fox Sports has produced over the years. Peter Schrager’s mock drafts were a must read. Feldman and Mandel are two of the best college sports writers on the internet. Even catchy viral content produced by outlets like At the Buzzer are nowhere to be seen now. The only possible selling point for FoxSports.com are “highlights” from the network’s debate shows. But if you’re really that big of a fan of Bayless or Cowherd, you’d be better served following those shows’ YouTube channels, where the content is updated more frequently and there’s more of it offered. There is absolutely no reason to visit this website any more. That is, of course, unless you want to watch videos that are weeks old or a random assortment of highlights from Fox Sports affiliates and rights partners or the Embrace Debate Mad Lib of the Day. It’s one thing to be concerned about Fox’s strategy and what it means for sports media as a whole, but it’s another thing to consider that Fox’s vision for their website, as controversial as it may be, is being poorly executed.